WAX PURE, active ingredients contained in WAX masks are getting deeper and are acting more intensively. they have a different purposes. 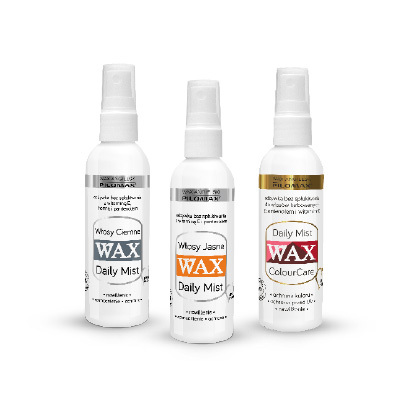 WAX DAILY for blonde hair – panthenol, white willow and aloes extracts. WAX DAILY for dark hair – panthenol, nettle and aloes extracts. WAX DAILY for greasy hair – liquorice, burdock and mentha aquatica extracts. 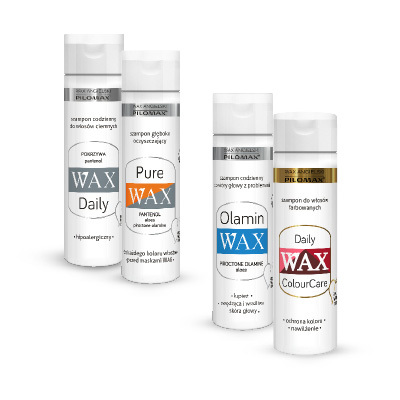 WAX DAILY for thin, fine and no volume hair – panthenol, collagen, chestnut and nettle extracts. eliminate dandruff – piroctone olamine (octopirox), soothing and moisturizing properties of Aloe Vera juice. WAX DAILY MIST ColourCare for dyed hair – panthenol, vitamin E.
WAX NaturClassic BLONDA for blonde hair – henna and chamomile extracts. WAX NaturClassic HENNA for dark hair – henna and green tea extracts. 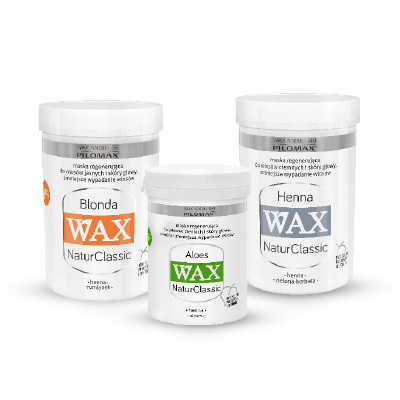 WAX NaturClassic ALOES for thin and fine hair – henna extract and aloes juice. masks give strengthening, springiness, sheen and healthy appearance to the hair since the first application! 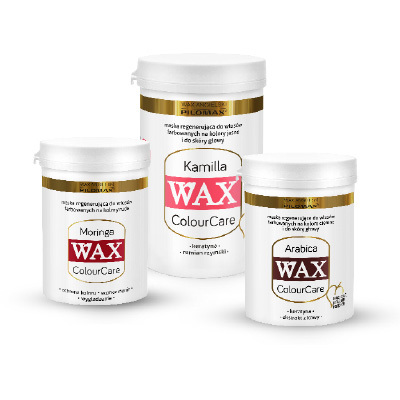 WAX ColourCare KAMILLA for blonde dyed hair – keratin, panthenol, roman chamomile, horsetail and henna extracts. 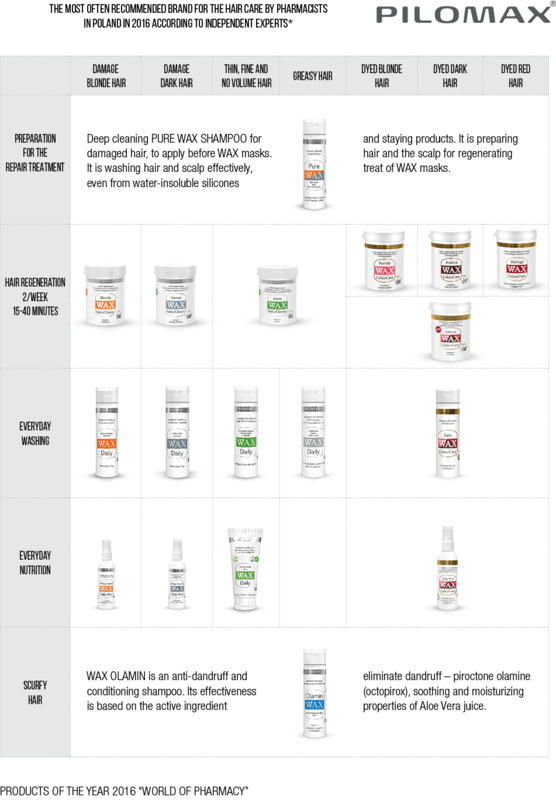 WAX ColourCare ARABICA for dark dyed hair – keratin, panthenol, arabica, henna and horsetail extracts. WAX ColourCare MORINGA for red dyed hair – keratin, panthenol, moringa extract. WAX ColourCare INTENSA color protecting mask – keratin, panthenol, moringa extract.